"WE CAN ALWAYS BE BETTER," BRIANA SWORDS EXPLAINED IN OUR INTERVIEW EARLIER THIS MONTH, "I DON'T TRY TO ACHIEVE PERFECTION ANYMORE, BUT I NEVER SETTLE." While we know this to be true already we were reaffirmed of Briana's distinct eye and incredible sense of curation during our recent visit at her shop Swords-Smith. Even in the midst of market preparation the store exuded an inviting, calming and all around creative ambiance - all of which have made Sword-Smith's shopping experience truly one of a kind. Though beyond just carrying great (read: our favorite) emerging brands, Briana has made it a point to take things one step further by truly establishing a sense of community. Today's studio visit touches more on this as we got a chance to spend some time with Swords-Smith stylist and visual merchandiser Tishka Dupera during a fun styling session with Brooklyn-based musician SVE. As style authorities in their respective fields, we were interested to learn more about what role Swords-Smith has played in their approach to fashion, their thoughts on contemporary design and what they're assembling daily. Meet Tishka and SVĒ below and head over to The Style Line for the second part of our chat. Tishka: I’m Tishka Dupera. I am 27 years old and a Brooklyn-based artist. Outside of my profession I am a writer with a focus in poetry and prose. I enjoy exploring the world I live in, whether it’s a long walk in my neighborhood or jumping on a flight to a place I’ve never been. I value that things are ever-changing, it reminds me to take one step at a time especially with the goals I’ve set for myself. SVĒ: My name is Sve, outside of being a Brooklyn Pop singer and songwriter... I am a dog mommy, I love going to new places and discovering life hacks that make daily tasks easier. I value my family and friends. I would not be who I am without them and their love and support. WALK US THROUGH YOUR DAY-TO-DAY AT SWORDS-SMITH. WHAT ARE YOUR FAVORITE PARTS OF THE JOB AND WHAT ARE YOUR GO-TO TIPS OR ADVICE FOR EMERGING STYLISTS OR THOSE LOOKING TO BREAK INTO THE CONTEMPORARY DESIGN SCENE? 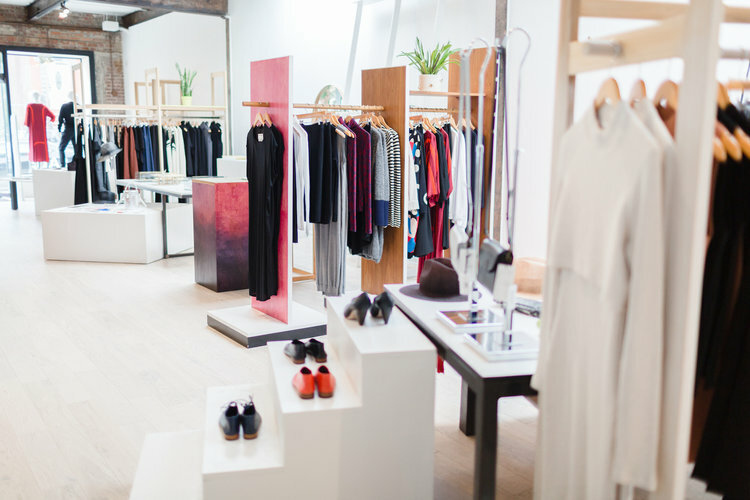 Tishka: My day-to-day at the shop consists of creative visual merchandising as needed, checking in new styles, ensuring that the website looks fresh and assisting our amazing clients. My favorite parts of the job are receiving new products and figuring out different ways to outfit each piece. My go-to tips for emerging stylists or those looking to break into the contemporary scene are the following: fit is key, the devil is in the details and always be versatile. WHAT ARE THREE ELEMENTS YOU LOOK FOR IN A DESIGNER WHEN PUTTING TOGETHER LOOKS FOR CLIENTS DURING FASHION MONTH? GENERALLY WHO ARE YOUR GO-TO DESIGNERS FOR JUST ABOUT ALL OF YOUR CLIENTS? Tishka: Three elements I look for in a designer are fit, versatility and fabrication. My go-to designer is Henrik Vibskov - his designs are voluminous, work with almost all body types, versatile because you can layer in so many ways and the fabrics feel good against the skin! AS A CUSTOMER HOW WOULD YOU DESCRIBE THE SWORDS-SMITH COMMUNITY AND HOW DO YOU THINK THEY ARE MAKING A DIFFERENCE IN THE CONTEMPORARY FASHION SPACE? SVĒ: I love Swords-Smith. I am a kid in a candy store when I am in there. They have the best selection of new designers and styles. I feel like they are risk takers and find risk-taking designers to bring into the neighborhood. The curation is simply so spot on as well. HOW WOULD YOU DESCRIBE YOUR RELATIONSHIP TO FASHION DESIGNERS? SVĒ: I can't say I feel designers are super accessible with today's search engines, sometimes they are extremely hard to discover. I have found you have to weed through a lot of stuff to find new and interesting designers. Luckily with a store like Swords-Smith I can easily walk in and find the best of the best new talent. Through that, I can go onto a social media platform, look them up and find more unique designers they are friends with. Tishka: I'm always building on being better than I was yesterday. SVĒ: Don't stop. Just don't stop. If today was a no, tomorrow will be a yes. If that makes sense!